You are here: Home / Life / Money / Where Does Our Tax Money Really Go? Where Does Our Tax Money Really Go? You work eight hour shifts every day and put in your best hard-working effort with every task, when finally your boss brings you your paycheck at the end of the week. You tear it open. The possibilities of different shoes and gourmet meals that you can now buy race through your head. But when you look at the total, it is a lot lower than expected. What’s up with that? Stop asking yourself, “Where do my taxes go?” Find out already. What Are the Main Types of Taxes That We Pay? If you know one thing about taxes, it’s that the whole concept is utterly confusing. And that starts with all the different types of taxes we pay because so many exist. But let’s take a look at the basic ones. But don’t worry, if you don’t make $10,000 this doesn’t affect you. “For people who are working their way through college, they may pay nothing when it comes to their federal income taxes,” said University of Maryland Associate Dean of Masters Programs and Professor of Finance Michael Faulkender. “They end up getting it back if they had anything withheld in the first place.” How do you make sure you get your money back if you make under $10,000? “If you’re a college student working part-time and you’re not making $10,000, you should fill out a W-4 form and put on there that you’re not liable for any taxes being repelled,” said Forbes senior editor John Koppisch. These taxes include Social Security and Medicare taxes and are taken out of an employee’s paycheck. FICA stands for Federal Insurance Contributions Act and it requires that both the employee and employer pay for the tax. The total FICA tax is 15.3 percent and the employee and employer both pay 7.65 percent, according to the IRS. Here is the breakdown of that 7.65 percent: 6.2 percent go towards Social Security and 1.45 percent goes towards Medicare. At least you’re paying just as much as your employer. A part of the payroll taxes that are deducted from your paycheck, these taxes act as a safety net if you are ever laid off, according to the IRS. “If you lose your job if the company goes out of business, you can file for unemployment insurance,” said Cindy Clement, a University of Maryland Senior Lecturer and Director of Undergraduate Studies in the Economics Department. The money you paid while you were working can be given back to you if you lose your job. But these are just the main taxes that people pay. There are also corporate income taxes (which Clement said are less relevant to students unless they have a hefty portfolio of stocks), sales tax on common store-bought items except for food, property tax and excise tax. But these just serve as the main taxes that people pay. You’ll also find corporate income taxes, sales tax on common store-bought items (except for food) and property tax. State and local sales tax money goes towards general government expenditures, according to Sapling. But what are some government expenditures, you ask? A majority of sales taxes from some state governments go towards education and health care. According to Center on Budget Policy and Priorities, state governments also use the money to fund transportation, assistance to low-income families, economic development, environmental projects, state police, parks and recreation, just to name a few. On the other hand, property tax goes towards similar expenditures, such as education, local police departments and maintaining infrastructure. Some say the federal government wastes tax money. Others say taxes aren’t high enough to pay for things. Check out how the federal government spends federal taxes so you can decide for yourself. Chart created by Ally Tobler. Percents from Pew Research Center. The “Other” category consists of public broadcasting, NASA, national parks, foreign aid, crop subsidies, highway repairs and a few other areas, according to USA Today. 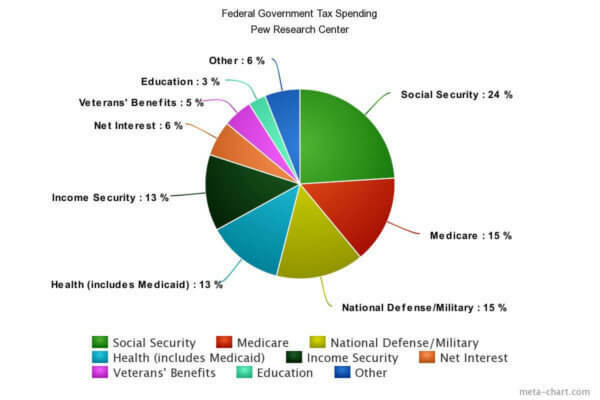 As you can see, the government spends a large portion of our paid taxes on Social Security, which you can take comfort in (or not—read below for more details). According to Pew Research Center, more than two-thirds of the total federal tax money in the 2016 fiscal year, which ended this past September 30th, went towards not only Social Security expenses, but other types of social insurance such as Medicare, Medicaid, veterans benefits, unemployment compensation, etc. Over the years, this has also doubled as the biggest area of growth for federal spending. The federal government also puts a lot of this money towards national defense. In the 2016 fiscal year, 15.3 percent of tax money was allocated for this. The next biggest category of spending is public debt. What is public debt exactly? Also referred to national debt, it’s an amount of money owed to lenders outside of a country, so this could be individuals, businesses or other governments outside of the U.S. According to Pew Research Center, public debt continues to grow and stood at $19.96 trillion in February 2017. What Should I Know About Taxes? Why Should I Care? Admit it, you probably know next to nothing about taxes. We don’t blame you. Even experts and economists consider it a complex subject. Nevertheless, that doesn’t give you an excuse to be ignorant. Here’s what you should definitely know when it comes to taxes, and it has to do with something you probably haven’t even started to worry about yet. That’s right: Social Security. We usually have the wrong idea that the Social Security taxes you pay go directly towards your personal Social Security savings. Hate to break it to you, but there is no such thing as any personal Social Security savings. Instead, the tax money you pay to the Social Security program goes towards retirees right now. But what you should be aware of is the fact that the program has been handing out more money than it’s been receiving in taxes. What does this mean for you? Besides Baby Boomers retiring, how else is the program running out of money? “There’s about $20 trillion worth of debt outstanding [in the federal government], but interest rates are very low right now by historical standards. If interest rates start rising, which is what everybody is anticipating, the portion of the federal spending from interest is going to rise significantly. Couple that with Baby Boomers retiring, Healthcare and Social Security spending is going to go way up.” said Faulkender. Yikes. Lighthouse Financial Advisor Luke Carey agreed that millennials should just be more in tune with prospective politicians. “Try to be informed about where your politicians are trying to spend the money. I think you’ll find that they are not super concerned about young people,” said Carey. Taxes make up a huge part of politicians’ campaigns. Now that you know what you’re paying, where it goes and what to look out for, you can vote for politicians who will spend your hard-earned tax money the way you want them to. In other words? Actually tune into those political debates and speeches instead of spending all your time watching The Bachelor. If you want to start adulting, this is the right way to do it. 100% guarantee that we'll be friends if you tag me in Harry Potter memes or Tasty videos on Facebook. Aspiring magazine journalist at the University of Maryland (but dabbling in marketing as well). Extreme Couponing or Extreme Waste of Time? Can You Make Minimum Wage Work in College? What is a Certificate of Deposit and How Do I Use It to Make Money Off My Money?